The damaged degree of forest ice-snow frozen disaster contributes to reduce the loss of forest resources and forest ecosystem management, which is of great significance to the restoration of forest vegetation. 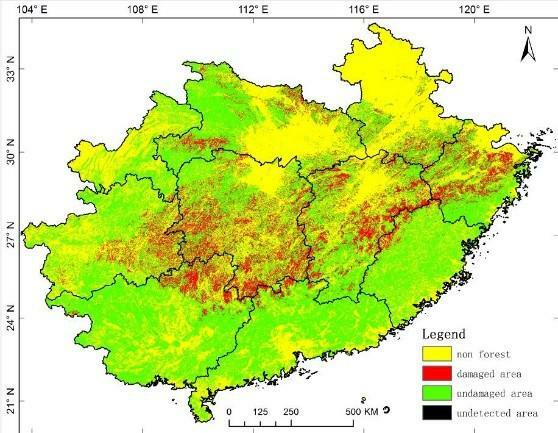 This datasets are divided into two parts: the spatial distribution of damaged vegetation and evaluation on forest losses. Based on the dynamic threshold method, NDVI data is selected to extract the damaged forest caused by ice-snow disaster in 2008 and assess the forest losses. This dataset can be used to post-disaster various researches. The assessment of damaged vegetation caused by ice-snow disaster. Disaster Risk Reduction Knowledge Service of International Knowledge Centre for Engineering Sciences and Technology (IKCEST) under the Auspices of UNESCO, 2017.6.30.http://drr.ikcest.org/info/91c50.